Pizza is definitely one of my favorite foods, and I’ve been craving it lately! A couple weeks ago I had some mushrooms, veggies, and mozzarella cheese sitting around, so this grain-free Crustless Skillet Pizza is what came out of it. The mushrooms and zucchini are kind of the replacement for the crust. Speaking of cravings, people who consistently eat unhealthy foods will generally crave more and more of them. If your body is asking for donuts you may want to tell it to be quiet! When you’ve rid yourself of destructive food addictions, though, you will know more clearly what you really need! As you make healthy changes to your diet it’s good to listen to your body, because cravings can become an important nutritional message. I think part of the reason I was craving pizza is because I needed the vitamin D that is found in mushrooms (I wasn’t really craving the bread part). Our family has been fighting lots of colds and even the flu this season, so my body was asking for reinforcements! On a side note, I think it’s a good idea to supplement vitamin D , because most Americans are deficient. I love the brand I’m giving you a link for! FYI, I’ve heard and read mixed reviews on whether or not cheese is healthy. It has a lot of calories, but it also has some healthy nutrients, like vitamin B12, which is hard to find in plant foods. My opinion is that it is ok to eat cheese in moderation if you’re not allergic to it. Grass-fed, raw dairy products are the best. Before we get to the recipe for the Crustless Skillet Pizza, I want to invite you to join with others who are making healthy changes. I’d love to walk alongside you in your journey towards wholeness and health! Jesus said, “I have come that they may have life, and have it to the full!” Freedom from food addictions is part of having a truly full life. Heat the coconut oil in a 12-inch cast iron skillet over medium heat. Add the mushrooms and onions, then sprinkle them with part of the salt. When the mushrooms and onions are starting to turn brown, add the zucchini and cook it for a few more minutes. Sprinkle the mixture with a little more salt and pepper and mix it. Try not to overcook the zucchini! Spread the tomatoes as evenly as possible over the mixture. Layer each of the rest of the ingredients on top, ending with the cheese. Let the Crustless Skillet Pizza cook for a few more minutes, until the cheese is melted. You may need to turn the heat down to make sure that the bottom doesn’t burn. If you’re really having a hard time melting the cheese you can place the whole thing under a broiler for a couple minutes. Enjoy!!! 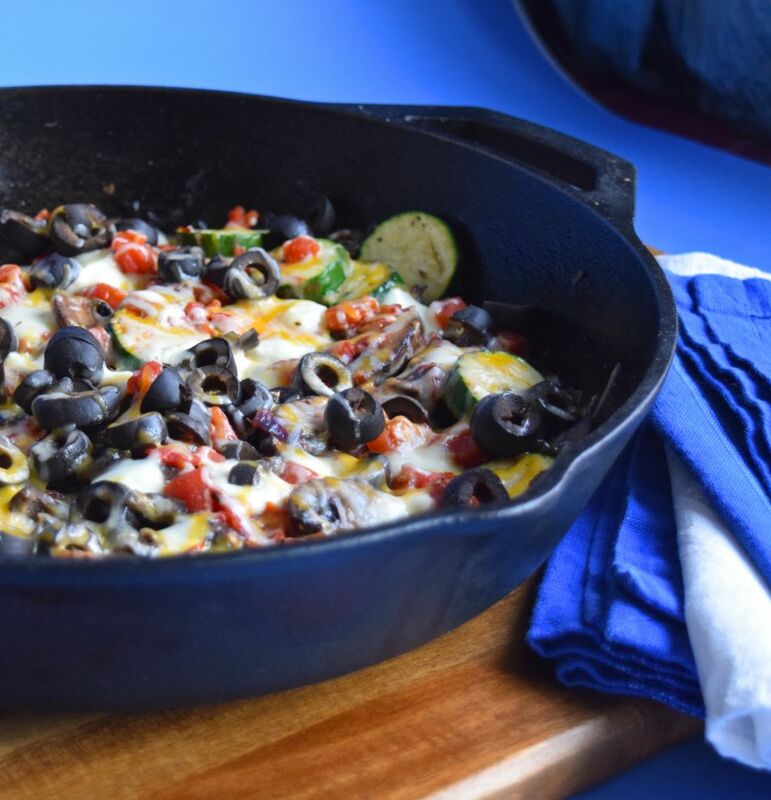 9 Responses to "Crustless Skillet Pizza"
This was soooo good! I added orange bell pepper and used the full can of diced tomatoes. Thanks! Glad you liked it!!! 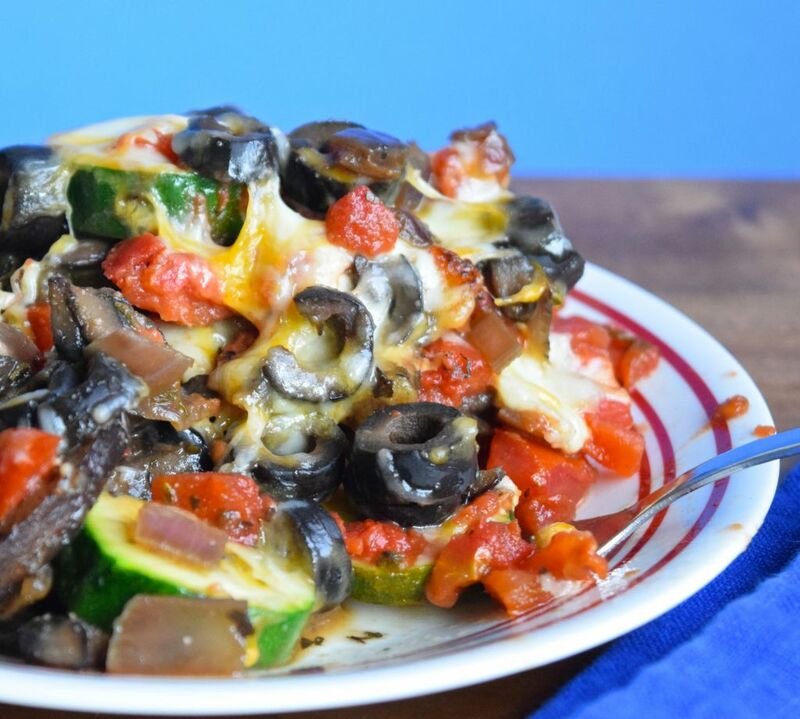 I used eggplant slices on bottom as my “crust”, used fresh sliced tomatoes and added artichoke hearts. Omitted salt due to artichokes, added freshly sliced garlic…Delicious! Big hit with a spinach side salad. Sounds good with the eggplant! This looks good. What do you think about adding ground beef? Have you tried it with any meat? Thanks! Meat would be good in there, but it’s best to keep the portion size small. Beef is best limited to once a week. Meat if hard for your body to process, but it does have some benefits, so I do eat it. Most days it’s chicken, turkey, or salmon for me :).